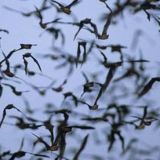 Wildlife Acoustics - Wildlife Acoustics Blog - In the Field: Mounting an SM4BAT mic using a telescoping feeder arm. With the purchase made, I started wondering and wondering about the field deployment set up of the recorders. To minimize recording echoes, I wanted the mic to be deployed as far away from reflecting objects as possible, so I needed a way to make good use of the 3 meter mic cable. With some ideas in mind, I started checking out some local fishing supply stores and found the perfect solution. The 360° infinite angle lock of an aluminum telescopic feeder arm is ideal for mounting the microphone anyway you like on a rod rest. It's telescopic so one can lengthen the arm and with the rod rest (cut off the upper end) the mic can be nicely and sturdy ty-ripped to it as can the mic cable to the telescopic arm. In the above initial set up picture, a wooden pole was used for attachment to the tree, but since the diameter of the above feeder arm is 25mm, I could not find a matching pole. Since I have some 250 meters of mistnets and associated 25mm aluminum and iron poles, I’ve used iron poles for the actual set up along with some eyebolts. In the pictures below you can check out this deployment set up. 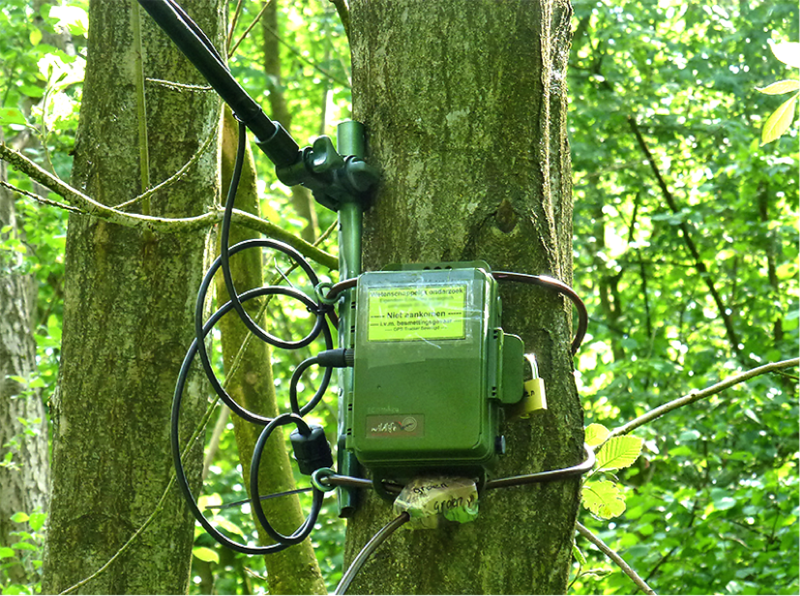 The cable lock goes through the eyebolts and the pole is hammered with nails to the tree for long time deployment. For short-duration, quick deployments, for example during mistnetting surveys, I use a big type of plastic spring clamps to tighten the feeder arm to the cable lock.